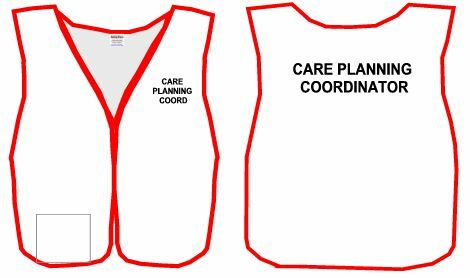 HICS 89 piece Vest Set for the Hospital Incident Command System. Used in hospitals and medical facilities during disaster drills and actual medical disaster incidents. Now required by most JACHO, compliance audits this complete HICS set will have your key hospital staff visibly recognized and better organized for major medical incidents and disaster drills. Twill cloth split-front style vests. 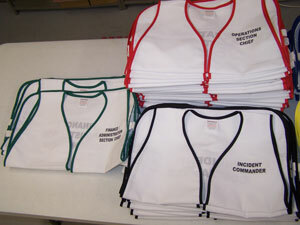 Vests are made ofWhite 65/35 poplin with colored edge binding to match the HICS title group . Vests are 18 in. wide by 24 in.in length. Vests feature 2 lower pockets, side elastic straps, front velcro closure with a small front title on the left-hand side front and larger title on the back. (*)- In the conversion from HEICS to HICS, several titles were omittedthat our customers have requested. Mainly the Triage Group of leaders. Because we received these requests several times, this is now part of our standard full set. See titlesmarked with one asterisk. (**) - Like the above, larger hospitalshave requested that specific critical departments groups be "re-included" in the set(HICS dropped include these). In additional the "Chaplain" title had never beenincluded, but we always get requests for this as well, so we have included thisas well in our full set. If you feel either of the asterisked group of verst are unnecessary, please talk to us changes or removal.